tree along roadsides. For centuries, it has been held in high esteem by Indian folk for its medicinal and insecticidal properties. Various pans of the tree have been employed to obtain medicinal preparations used in Ayurvedic and Unani systems of medicines. There is hardly a disease where the use of neem is not mentioned. of 'Silent Spring' by Rachel Carson highlighting the potential dangers of synthetic pesticides to man and his environment. Neem is a renewable source of various useful products (Fig. 1). It finds application in medicines, soap making, pest control, nitrification inhibition, slow nutrient release manure,. cattle feed, fuel, energy, ete. It has emerged as the single most important source of pesticides and allied products. All parts of the tree such as leaf, flower, fruit, seed, kernel, bark, wood, and twig are biologically active, the maximum activity being associated with the seed kernel. 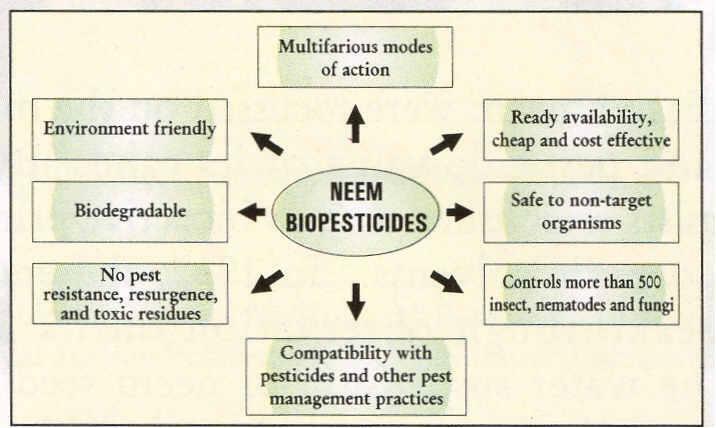 Biopesticides based on neem are endowed with features of diverse activity and relative safety to non-target organisms. A broad spectrum of activity against insects, phyto-nematodes, plant pathogens, etc., is exhibited with multifarious modes of actions. Worldwide, more than 500 pest species are controlled. Its multi-pronged effects against insects as repellent, antifeedant, oviposition deterrent, molting or growth disrupt or, sterilant, ovicide and oviposition deterrent help to effectively control a variety of farm and household insect pests and pathogens infesting agricultural, plantation and cash crops. In agriculture, neem products are valued for their effect as slow N-release materials and as nitrification inhibitor also. The observations of the Institute's scientists on the activity of neem received initially a lukewarm response from the international community. While validation trials carried out by different national and international groups yielded inconsistent results, confirmation of the activity by Prof. H. Schmutterer's group in Germany sparked the interest of international community on this wonderful tree. Two Research Bulletins, 'Neem in Agriculture' published by the Institute in 1983 and 1993 consolidated the progress made world over. N eem Newsletter initiated in 1984 by IARI and published quarterly sustained the involvement of the global community. The tree's international recognition was borne out by a publication, "Neem: A Tree for Solving Global Problems" published by the National Academy of Sciences, USA in 1992. Subsequently, two other publications entitled "Neem: Research and Development" in 1993 and "The Neem Tree" in 1995 projected the potential of this wonder-tree. Following this, a large number of pest control and health care products started appearing in the international market. Several of these are now registered in USA and other countries for diverse applications in agriculture. Neem contains a large number of chemically diverse and structurally complex bioactive tetranortriterpenoids commonly referred to as C-seco meliacins or limonoids. Some of the potential compounds include a number of azadirachtinoids, salannin, desacetyl salannin, nimbin, desacetyl nimbin, etc. The bioactivity related research on this plant has focussed on azadirachtin because of its abundance and unique mode of action. It does not knockdown or kill the insect instantaneously like most neurotoxic insecticides. Instead, it elicits physiological and behavioral responses in insects, which lead to their death. The azadirachtinoids are a mixture of twelve closely related meliacins, which constitute 0.3 to 0.6% of seed kernel. Several extraction techniques using either methanol, ethanol, methyl ethyl ketone, methyl tert-butyl ether or water, or their azeotropic mixtures as solvents, and separation techniques such as column chromatography, preparative thin layer chromatography, vacuum liquid chromatography and reverse phase medium or high pressure preparative liquid chromatography have been described for obtaining major azadirachtins such as A, Band H and other bioactive meliacins. Most of the processes have been patented. While liquid chromatographic and supercritical fluid chromatographic methods have been developed for their analysis, the structures have been established by IH NMR, 13C NMR and mass spectral techniques. A number of cyclic tri- and tetrasulfides, identified from the steam distillate of the fresh matured leaves and head space volatiles of crushed seeds, have been reported to possess insect repellent and spermicidal action. Structure-activity relationship studies on the two fragments of azadirachtin, i.e., dihydrofuranoacetal and decalin moieties, revealed that the former imparted antifeedant activity and the latter caused disruption of insect growth and development. A milestone in neem chemistry has been the synthesis of these two chemical moieties by a group of chemists led by Dr. Steven Ley at Imperial College, London. Azadirachtin is unstable to heat, light, water, pH, microbes, etc., because of which its effective life under field conditions is short. Several attempts have been made in the past to stabilize it either by structure modification or use of UV screens and other stabilizers. Its reduced derivatives, namely, dihydro- and tetrahydro-azadirachtin are more stable to light, heat, moisture, etc., and also retain the bioactivity. The Institute has contributed enormously in the last four decades to the research and development of neem. The chemists joined hands with biologists in unraveling the multifarious actions of neem. Extraction and isolation protocols for various bioactive neem constituents were established for the first time in most of the cases. Bioassay - guided isolation of neem pesticidal constituent was employed in collaboration with entomologists, pathologists and nematologists. Preparation and performance of crude or standard and stable products has been the key domain of neem research and development. Azadirachtin concentrates Insecticidal products are standardized and valued based on their azadirachtin-A content. Owing to this, there is interest in the development of such concentrates, which have become an important commodity of commerce. Technology for the preparation of azadirachtin concentrates of varying strengths has been successfully developed. The seeds/ kernels (shade dried at ambient temperature to avoid decomposition of the active ingredients) are crushed and defatted (cold press or extraction with non-polar solvents like hexane or petroleum ether) to yield neem oil. The residual cake after extraction in a suitable solvent is partitioned in a chosen blend of organic solvents to remove water soluble carbohydrates, proteins and other unwanted polar co-extractives. The crude meliacin concentrate containing azadirachtins is worked up to obtain azadirachtin powder. The crude product can be further purified by flash chromatography, controlled precipitation and crystallization. Cost effective extraction techniques employing minimum quantity of organic solvents have been developed (Scheme-l) . Azadirachtin powder concentrate obtained (see Scheme-l) has been further purified by column/flash chromatography, medium pressure liquid chromatography (MPLC) or two-dimensional thin layer preparative chromatography to isolate azadirachtins- A, Band H in pure form. Their structures have been confirmed by electro-spray ionization (ESI) mass spectrum which has shown molecular ion . peaks [MH]+ at m/z 721, 663, and 663, respectively, corresponding to the molecular formulae C3sH44016' C33H42014 and C33H42014 (Fig. 4). The major fragment ion peaks originated as a result of elimination of water (18 amu), acetic acid (60 amu) and tiglic acid (100 amu) units from the parent molecular ion. standardized for hydrogenation of azadirachtin-A concentrates to 22, 23dih ydroazadirachtin-A (Indian patent appln. No. 1590/DEL/99),and tetrah ydroazadirach tin concentrates in quantitative yields under ambient/near ambient reduction conditions (Indian patent appln. No.1126/DEL/2003) (Fig. 5). It comprises hydrogenation of technical azadirachtin concentrates of appropriate strengths in the presence of a suitable catalyst. The reaction resulted in 90% conversion yielding 65-85% product. The structures of reduced azadirachtins have been established by lHNMR and mass spectrocopy.